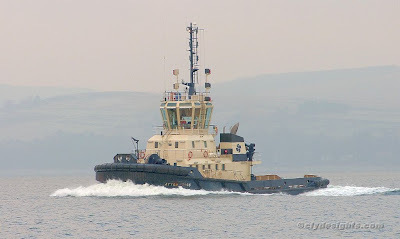 Little shipping activity has been noted over the past few days, especially during daylight, but this morning all three Clyde-based Svitzer tugs made their way down the firth to assist two bulk carriers changing over at deepwater berth at Hunterston. AYTON CROSS was seen as she passed McInroy's Point, having followed SVITZER MALLAIG from the James Watt Dock. WARRIOR III followed behind shortly afterwards.